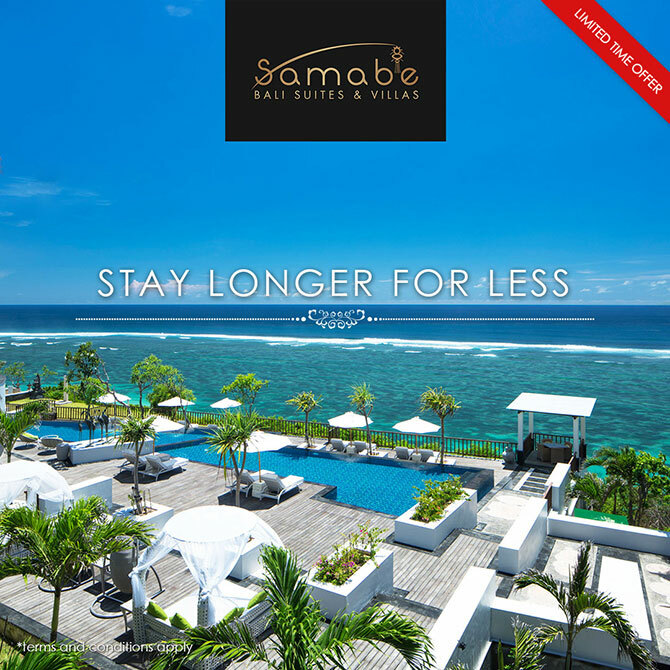 (Nusa Dua, 8 July 2016) Samabe Bali Suites & Villas is launching a new flash promotion this month "Stay Longer For Less" for the elite travelers that are designing a travel itinerary to Bali. It will offer discounts for the customers for a minimum 3-night stay and bigger discount for a longer stay. The deal will be reservable only on the official website, www.samabe.com, starting from now until 30th August 2016 for staying period between 1 August 2016 to 24 December 2016. "Stay Longer For Less" is non-refundable and applicable only for villa reservation. "We would like our customers to experience the true luxury of Samabe, and 2-night stay will not be enough to feel the service excellence, the serene ambiance, and the high-quality facilities that we offer at Samabe," said Ralf Luthe, the General Manager of Samabe Bali Suites & Villas. Samabe Bali Suites & Villas is a five-star resort located atop the cliff of Nusa Dua, the southern part of Bali. It sits on an 8-hectare area with 81 suites & villas. It offers Unlimited Privilege or all inclusive package consisting 24-hour butler service, unlimited food and beverage, and Samabe signature activities.